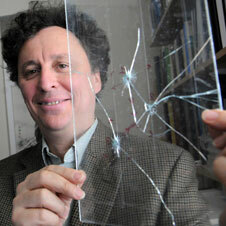 (Nanowerk News) In research published in the March 4 issue of the journal Nature ("Helical crack-front instability in mixed-mode fracture"), Northeastern University physicists have pioneered the development of large-scale computer simulations to assess how cracks form and proliferate in materials ranging from steel and glass to nanostructures and human bones. For years, scientists have tried to understand the propagation of cracks and how they affect the materials in which they form, said Alain Karma, distinguished physics professor and lead investigator on the project. Karma examined how cracks form in different materials. Karma and the research team started out by examining the combined effects of two types of stress on crack propagation: shearing and tension. Shearing occurs naturally when material is twisted out of shape while tension occurs when material is pulled out of shape. The combination of shearing and tension causes crack instability. The mechanism for how this instability develops and spreads, however, remained elusive until Karma utilized the power of a computer. Large-scale computer simulations yielded the surprising result that shearing and tension cause cracks to take the shape of a helix. Based on the simulation results, Karma and his team developed a theoretical equation to predict how the helix would rotate, expand and multiply in different materials. The research could yield innovations in the production of lighter automobile and aircraft parts that reduce energy consumption, and composite artificial bones that will not fracture when inside the body. The results also have implications for understanding the evolution of geologic faults and fractures in the earth’s crust.